Friends of mine have been complaining about Christmas music being on the radio already. And while I understand that sentiment, I also just love Christmas music and am thrilled to be able to listen to it longer than just in December. Which is one of the things I love about doing reviews. I get the chance to "have to" listen to a CD like On a Winter's Night by Jim Brickman. "I know it is only November, honey, but this is a review!" When Family Christian gave me this opportunity, I knew I had to go for it. 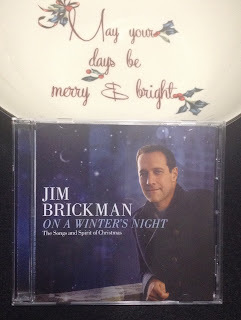 Lots of years ago, my sister-in-law gave me a Jim Brickman CD (or tape? Could it be that long ago?) for my birthday. I had never heard of him, and I probably rolled my eyes a bit, as I sometimes get a little weird about other people's ideas about music I'd enjoy. But I loved it. If it was a tape, I'm sure I wore it out. Jim Brickman has revolutionized the sound of solo piano with his pop-style instrumentals and star studded vocal collaborations. That trend continues with On A Winter's Night, which is a soothing collection of personal favorites on solo piano. I love this. There is a great mix of music on here, many of which sound very traditional. Lots have little riffs of traditional songs in there, and that mix is just so pretty to listen to. About two-thirds feature just the piano, which are really my favorites. A few feature someone singing. Kenny Rogers, John Oates, and a bunch of names I don't recognize. They all have beautiful voices, and they fit their songs so well. One also has a violinist, Tracy Silverman. This is simply beautiful. Christmas in Brazil. I think my favorite song is the piano-only version of Blue Christmas. I am a big Elvis fan, so I am partial to this song. And this wordless version is lovely. My kids love John Oates singing Night Before Christmas. The words are not quite exactly the same as in the poem, but they are so very close. The best part of this CD is that the music is just so gentle and not completely in-your-face Christmas music, so listening in November doesn't seem wrong at all, and it will be quite relaxing as Christmas gets closer too. I have a copy of this amazing CD to give away! US only please. My daughter and I start SINGING Christmas music about the second week in September! Because we're both in choirs that have to start rehearsing for Christmas concerts. We don't actually start LISTENING to Christmas music till about halfway through November. We start actively listening to Christmas music right after Thanksgiving and we continue to listen through January 6/7 making sure that we listen for the full 12 Days of Christmas. But I've been known to listen to some "Christmas" music all year long! Typically, I start listening to Christmas music after Thanksgiving/December 1. I've never heard Jim Brickman. We start listening to Christmas music when we put up the Christmas tree, typically the weekend after Thanksgiving. This year Lauren's been singing songs for our church Christmas musical for months though. I love to listen to Christmas music right after Halloween. We have a radio station that plays Christmas music 24/7 starting the day after Thanksgiving. It's wonderful!